When we started this process, we had heard that wishes can sometimes take a while to be fulfilled. We were prepared to wait for months but everything seemed to just fall into place. 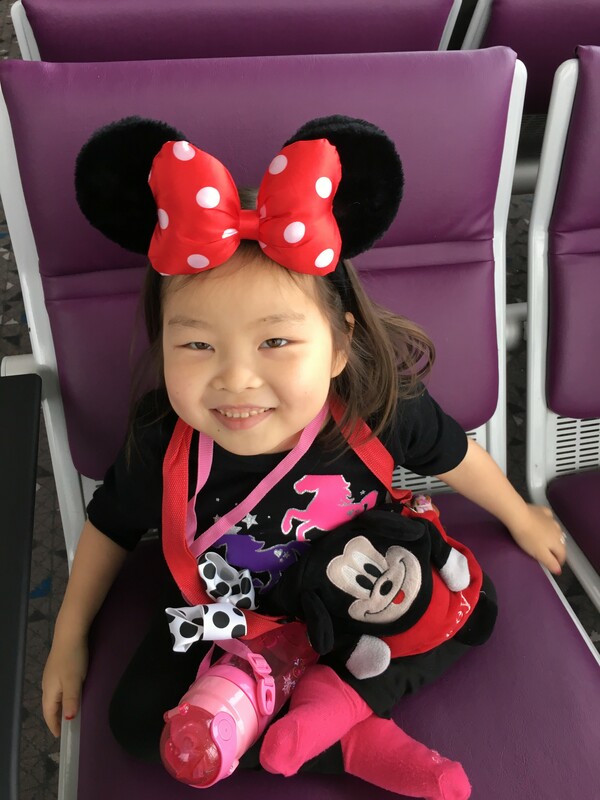 In December we agreed that her physicians could nominate J.J. for a wish. In January we heard that her wish had been granted. At the end of January, Brooke and Marcy visited and went over all the paperwork and figured out what J.J.’s wish was. We had the reveal party on the 14th of February and were prepared to wait until the end of March or so for the install. Imagine our surprise when Anna, from Make-A-Wish, called to ask if they could do the install this week. When J.J. decided on her wish we agreed that we would use the sunroom for her playplace. The room has lots of windows and is sunny and bright. It also has a peaked 18 foot ceiling. It’s a narrow room but it’s where the kids love to play. 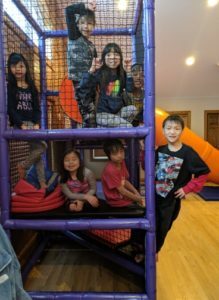 We hired a great guy to put french doors in the two big entry ways leading to the living room and dining room, and to put in a door to close off the back end of the room so it could be a contained space for everyone to safely play. When we were discussing the plans with Brooke and Marcy, Dan mentioned how much J.J. wishes she could play on the playplaces at restaurants. J.J. is very small and she scoots around on the floor. It’s hard for her when bigger kids are running over her. Her immunosuppression makes everything more difficult too. We try to keep her away from anyone who is sick. Honestly, unless you meet her in person, it’s hard to even imagine how small she is when she is sitting and scooting. As you can see she’s a tiny girl. I had made this picture when we were trying to show her size to the grant committee. 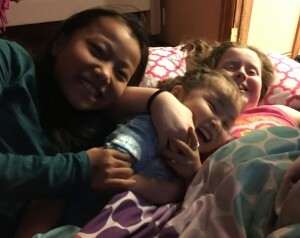 J.J. is 11, Maisey is 8, and Evie is 7 in this picture. Dan mentioned again how it would be wonderful if we could make something like this happen for her. I couldn’t even let my mind go there. I know that those playplaces are expensive and thought there was no way something that awesome could come true. Dan told me to just see what God has planned for J.J. and not limit what we think they can do. 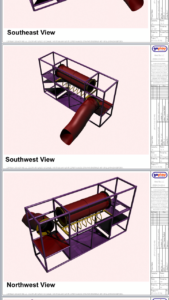 Imagine my surprise when they sent the original plans. 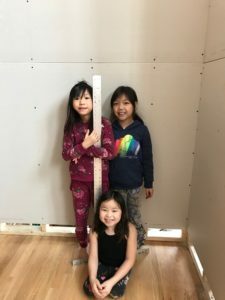 We taped the dimensions off in the room and showed the kids where it would go. We thought we had a clue. These two guys have been at our house for three days, patiently answering questions and having little eyes sneak peeks around the corner at them, while they were installing this beast. I don’t know what to say. We are feeling overwhelmingly blessed. 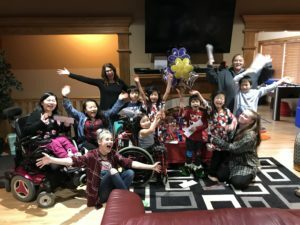 They made a dream come true for a little girl, who has been through more than any child should ever have to endure, and her very, very, very excited siblings. 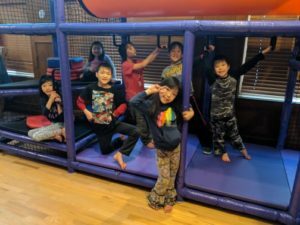 No more boring recesses at the Ellsbury home school. I wish I could share with you the squeals of delight we heard for hours tonight. Don’t let Max’s face fool you. He had more fun on the playground than anyone else. He ran and ran and ran through the tunnels and down the slide and across the monkey bars. He just never, ever smiles in pictures. They will all sleep well tonight. J.J. is beyond thrilled and so very happy. I think her smile says it all.. 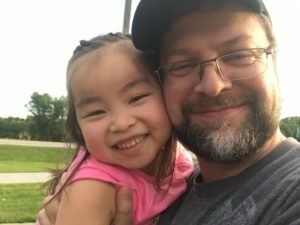 Thank you Make A Wish Iowa and Go Play Systems for making our little girl’s dream come true!!! In January 2018, J.J. received a new kidney through a transplant. 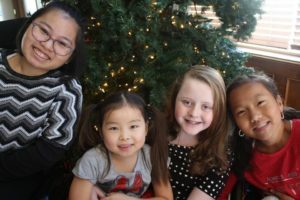 While J.J. was in the hospital recovering, her doctor informed us that she could be granted a wish from the Make A Wish Foundation. We went home and thought about it some more. We weren’t even sure J.J. would understand what being granted a wish meant. We didn’t try to explain Make A Wish (MAW) to J.J. but we did ask her what she would do if she could have any wish she wanted. Her answers were so sweet, but we couldn’t make any of them come true. I wrote about this conversation on Facebook. Here is that post from October 2018. Elyse – No more orphanages. J.J. – A family for every kid. Maisey – No more mean people. Evie – I would wish to be a genie so I could make everyone happy. Me – No, I mean a wish you could actually make happen. Elyse – To Travel the world and save a million souls. JJ – No more stealing little girls. Elyse – Yes, no more slavery of any kind. JJ – To adopt a baby. Evie – To have a pet zebra that I could hug every day. Maisey – To be tiny so I could ride a butterfly. Me – Does anyone have any wish that could actually come true? 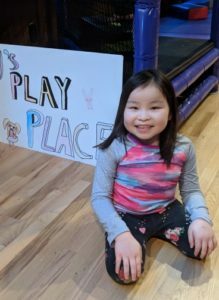 Elyse – An underground playplace where Grace and I can secretly hang with our friends. Me – That’s a little closer to something that could actually happen. Maisey – I am gonna be a ninja. Evie – I am just gonna make people happy myself I guess. Grace – A car would be nice. I can drive in 3 years. JJ – But mama I don’t need anything. 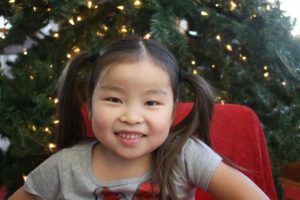 In December her team at the hospital informed us that if we were going to do a wish, then we would have to proceed soon. 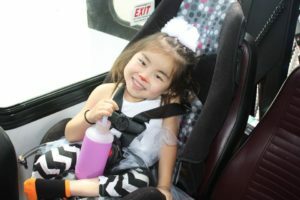 J.J. needed to be nominated within the first year of her transplant and we were fast approaching the one year mark on January 1st. We decided to let them nominate J.J. and see if she would even be granted a wish. 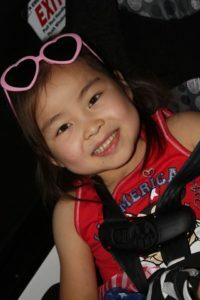 After we received the letter granting J.J.’s wish, we decided to be honest with J.J. and ask her about specific wishes. Make A Wish sends out a book and paperwork that you can ask the child questions about. We asked her about celebrities she wanted to meet – there weren’t any. We asked her about traveling – she said, “I’ve already been to Disney. I didn’t like it very much.” We asked her to consider if there was anything that she could think of that she really wanted. It could be a big wish. She just had to let us know and she could draw a picture if she wanted to. She came to us first asking about helping orphans. 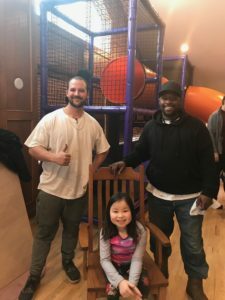 We told her that we loved her heart but this needed to be a wish that could be granted and that we, as a family, would always do what we could to help orphans. She came back to us with the idea for an indoor playground. 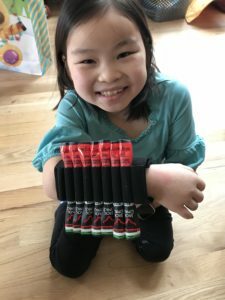 She drew out her pictures and told us what she wanted and why she wanted it. Big play places have big kids that run her over and scare her. She is supposed to try to not get sick. Her brothers and sisters would love it. She wants to surprise her brothers & sisters. It’s cold like half the time here. She likes to play with her brothers & sisters. Low monkey bars that her and Elyse can do. Rock climbing wall with one of those soft things you can fall on for Maisey. A lookout tower to see the tall windows. Her request was just so sweet and well thought out. It was hard to say no after that. Dan and I thought long and hard and decided to let her have her dream. Well, honestly it didn’t take long to make the decision after seeing her sweet face excitedly tell us all about her plans. The best part of all of this is that she wanted it to be a surprise. She has been so cute keeping her secret. I have to admit that it has been almost as much fun watching her plan her secret as when she was granted the wish. Brooke and Marcy, volunteers with MAW, came out to our house to ask J.J. questions. J.J. told them what she wanted and why she wanted it and they were so excited for her. My favorite part of them asking her questions was her answer to how do you see your wish playing out? J.J.’s answer was so sweet. She said she could see her brothers and sisters saying, “Wow J.J.! You are really good at keeping secrets. This is amazing! You are the best!” She could hardly contain her excitement. Brooke and Marcy told her that they were unsure if they could make that wish come true but that they would really try hard. It wasn’t a wish that they had ever had before. They asked her for a second option in case they couldn’t make the first wish come true. 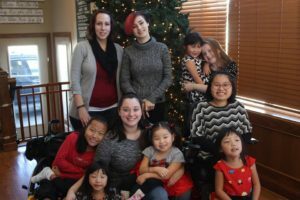 J.J.’s request for her second wish was to adopt a baby. Brooke and Marcy told her that they couldn’t make the second wish come true. They asked her if there was anything else and J.J. told them no. We had been told that wishes can take a long time to be planned. That they would let us know when they heard anything. 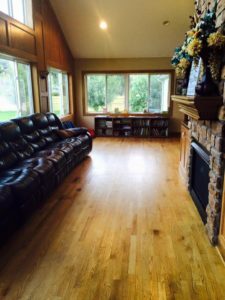 We were so surprised when just a few weeks later MAW called and said that they found a company willing to work with them and they had a plan they were sending our way. It was amazing! 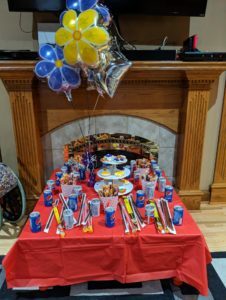 We couldn’t wait to show J.J.
Marcy and Brooke emailed and said that we could have a reveal party. I told them our son and family would be home from Wisconsin next weekend and asked them if that was too soon to have the party. 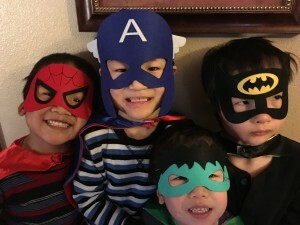 They were beyond kind and agreed to having a party on very short notice. We decided not to tell J.J. about the party so that she could be surprised too. We would have her play down in the basement with her siblings and then Grace, who was in on the secret, would bring her up and we would surprise J.J. and then we would bring up everyone else and she could surprise them. Marcy came up with a great idea where everyone got an envelope and inside the envelope was a picture of the playground. J.J. had them hand out the envelopes and then she counted to three and had them open the envelopes. In hindsight I realize that we probably shouldn’t have surprised her. She needs time to adjust to things. I remember when we gave her her first wheelchair. 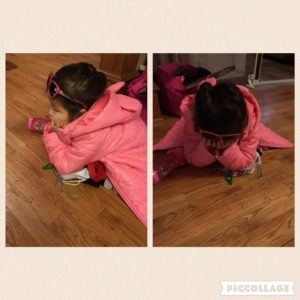 She sat in the chair and cried for an hour because she was so overwhelmed with the gift. She was very quiet during her party. She was happy but I could tell something wasn’t quite right. After it was all said and done I asked her what was wrong. She told me that she was just so happy that she was having a hard time not crying and she didn’t want Marcy and Brooke to see her tears and think she didn’t like her party. So now we wait for the very special date when they will install her playground. We have heard that it could be as soon as next month. I still can’t believe this is happening but this is one gift that will be used over and over again. 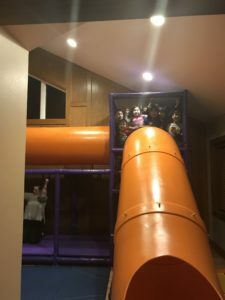 In the plans, J.J. got her low-to-the-ground monkey bars, a covered slide, and a tunnel to hide out in. J.J. picked the perfect gift. She has such a sweet heart. Dan and I LOVE the way she included everyone in her idea. I can’t wait to watch them play and hear their laughter while they enjoy J.J.’s gift. 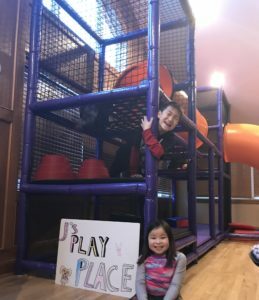 We are going to call it “J’s Play Place” so everyone remembers to be thankful to their sister who included them in her dream. 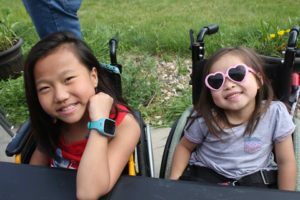 Thank you Make-A-Wish Iowa for making one very special little girl’s dream come true. I feel like I should share this story of walking in faith and God’s grand provisions to give Him glory, BUT these stories are hard. How do you praise God for this answered prayer for J.J. when you know it meant unanswered prayers for someone else? Somewhere parents weep for their child who they said goodbye to and because of their selfless act our J.J. gets a second chance and we get to celebrate. We’ve buried a child. I know the pain that brings. Kyle was wanted. He was planned. He was celebrated. He was also born too early. We prayed for healing, our family prayed, churches prayed and yet Kyle died. Why? Why would a child that a family wants so badly die, but other children live and are left to die? Why would ANY child die? How can you make sense of any of the unfairness in this the world? I don’t have the answers and have accepted the fact that I won’t have the answers this side of heaven. All I know for certain is that I trust in a perfect God whose thoughts and ways are way beyond anything I can comprehend. A perfect God who doesn’t make mistakes. A God who can make good come out of the bad. I believe God didn’t mean for that child to die. Just like God didn’t intend for our children to need a Plan B for their parents. Profound sadness leading to our great joy. It’s too much to bear sometimes. During our last nephrology appointment, we were asked to talk to the transplant team about listing JJ on the active transplant list. JJ had been listed as inactive, accruing time, for almost a year, and they felt like it was a good time to list her and be very selective in the kidney that we accepted. The doctors were pretty insistent about listing her now. They went through all the information about dialysis and what could happen if she got one nasty illness. They agreed with us that she was the stablest she’s ever been BUT they still wanted to put her on the active list and be really, really selective. They assured us that we didn’t have to accept any kidney we didn’t want to accept and if we weren’t ready to proceed, we could turn it down. They felt like it could take quite some time to find the perfect kidney so listing her sooner rather than later would be better. We’ve had to make these hard decisions before with our cardiac kids. Do you proceed with the heart surgery hoping to extend the length and quality of their life for many, many more years and risk that they may die in the process? Is the risk worth it? Do you proceed hoping for healing and extra years with them or do you just enjoy the time you have left? These questions are hard. No one can tell you the right time to move forward. No one can tell you what the right thing to do is. There are no clear cut answers. All you can do is gather all the information you can, pray, and proceed. This was where we were with J.J. We were hoping to not wait too long so that she would have to start dialysis. 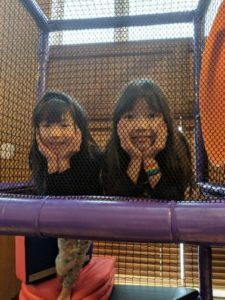 We didn’t want her to be even more ill when we proceeded with the transplant, but we also selfishly wanted to enjoy the time we had with her because major surgeries are always risky and their are no guarantees. 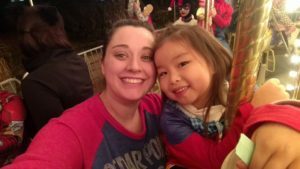 We knew she had had some psychological difficulties after her surgery in August and wanted to let her heal emotionally as well as physically before the transplant. In the end, we decided to list her on the active list and be really, really selective. We were told it could be months maybe even a year before the perfect kidney presented itself. On January 1st, after a short wait on the transplant list, our nephrologist called and said I know this is crazy but the transplant surgeon just called me. We have a donor kidney. I know we said we would be selective and turn down any kidney that’s not perfect, BUT this kidney is a perfect match. It’s a young donor so it’s the perfect size for her little body. (Believe me when I say no one wants to hear those words…young donor.) The kidney doesn’t have to travel far. There are no antibodies to worry about. This is the perfect kidney. Would you please consider accepting this kidney? We were blown away? The very first kidney that we were offered is the perfect kidney? So soon? Was this the right time? Should we proceed? What if we said “No” and never got another chance? We were called around noon, we talked and prayed, accepted the kidney at 1:30 and arrived at the children’s hospital at 4. Talk about a whirlwind of emotions, but in the end when something this miraculous happens how do you say no? Last year I did a poor job chronicling our lives. 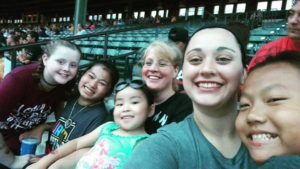 My blog is my journal for our children. I want them to have their memories written down for the future. I vowed that this would be the year that I stayed on top of everything and then we got strep and I was already behind. When we first received JJ’s file, I looked at her birthdate and it took my breathe away. One day after my mama’s. Ever since my mom passed away January 5th has been a sad day. My mom, my mother-in-law, and I always did craft sales together at Christmas time. We mainly did Christmas items so on my mom’s birthday we would load up the car and head out to find all the after Christmas items on sale for our craft sales the next year. We would eat at her favorite restaurant, Red Lobster, and we would have the best girls day out. It was one of my favorite days of the year. It was just fun to celebrate mom and hang with my friends who just happened to be my mom and my mother-in-law. I miss my mom. I miss those days. I miss staying up late and crafting. I miss setting up our display at the sale and hanging out and eating warm chocolate chip cookies while we caught up with our friends at the sale. I miss all of it and my mom’s birthday is a constant reminder that it isn’t going to happen again. So when I saw JJ’s birthday, it made me sad because I know how sad I am on January 5th and I wondered how I could be happy on the 6th, BUT God in all His infinite wisdom knew better. He gave me a little bundle of joy that eased the pain of January 5th by allowing me to celebrate January 6th. Psalm 30:5 Weeping may tarry for the night, but joy comes with the morning. And what joy JJ has brought to my mornings. Jessica Jean is the name she was given but she is JJ or Little J. She is a bundle of joy and her smile lights up our house. Her first month home included a hospital stay where she learned we would never leave her side. It took her a while to warm up to the idea of family and what that meant. I think we overwhelmed her. She had spent a lot of time alone in the orphanage. 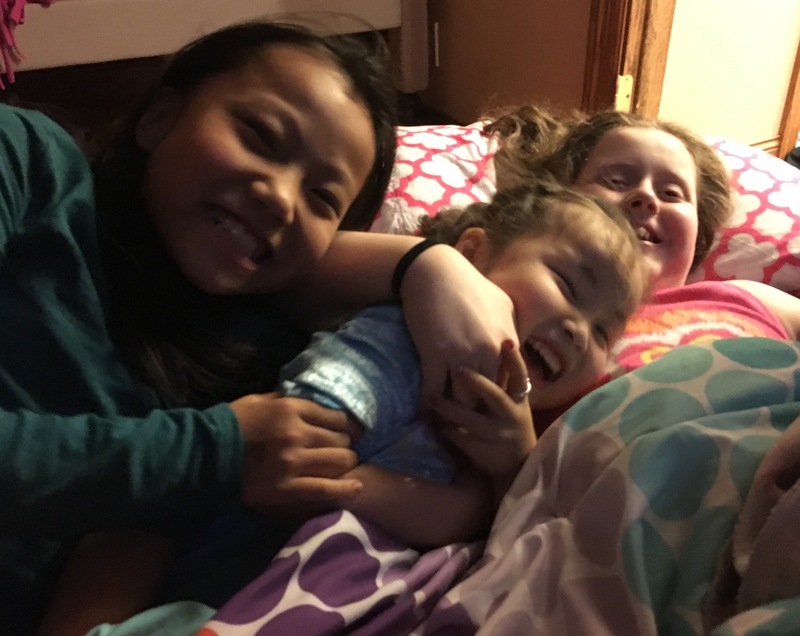 She felt safe with Gracie and Elyse and learned what the love of a big sister meant. 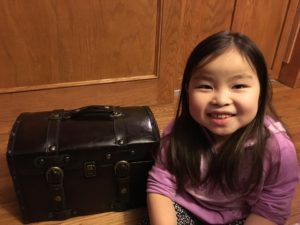 and the wonders of a treasure chest full of her favorite chocolate treats. and oh the joy she brought to our days. and a very big pink bed. She had her first picnic. She met some new friends. and learned how to play princess. 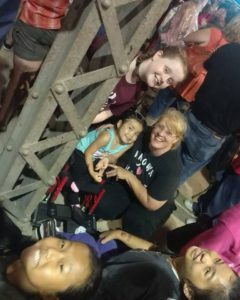 She went to her first state fair concert. Which got rained out and she learned what a summer storm was as we hid out under the grandstand where she learned mama would always keep her safe. and as a pirate for Krispy Kreme’s Pirate Day! 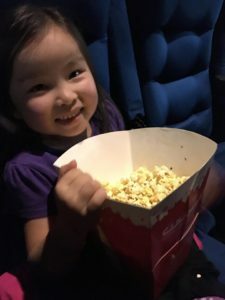 She went to her first movie and ate her weight in popcorn. and watched her very first fireworks display. She dressed up for her very first Halloween. and had her first carousel ride. 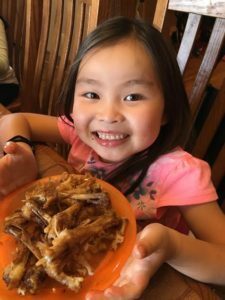 Mommy and daddy learned how to make chicken feet just the way she likes them. She learned about Thanksgiving and Christmas and loved decorating the tree. 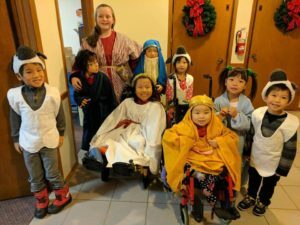 She played a wise man in our church’s Christmas pageant. She enjoyed playing in her first snow. She enjoyed her very first birthday party ever. 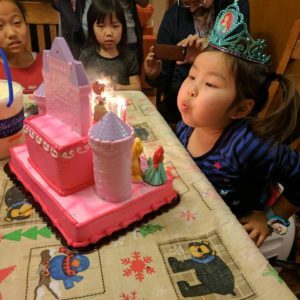 This was the first time that someone had celebrated the day she was born and she was overcome with emotion but by the time it came to blow out the candles on the cake, she was getting into the celebration. 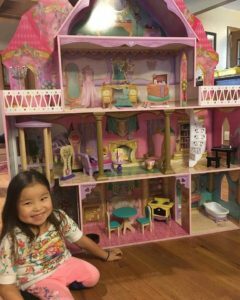 And she loved her doll house that was bigger than she is. JJ has learned that big sisters are a pretty big deal. and she’s got a bunch of them that spoil her silly. What an amazing, incredible, wonderful, blessed year this has been. Happy birthday Jessica Jean. Mommy and daddy adore you and your feisty, spunky, quiet, brave, spirit that brings such joy to our lives. Cassie had a long conversation with Jasmine the other day about Jessica’s hospitalization. Jasmine told Cassie that she believes God knew that Jessica needed more time with just Dan and I. Jessica needed to know she could trust us and that we would be by her side through it all. Jessica needed to be held and to be comforted. 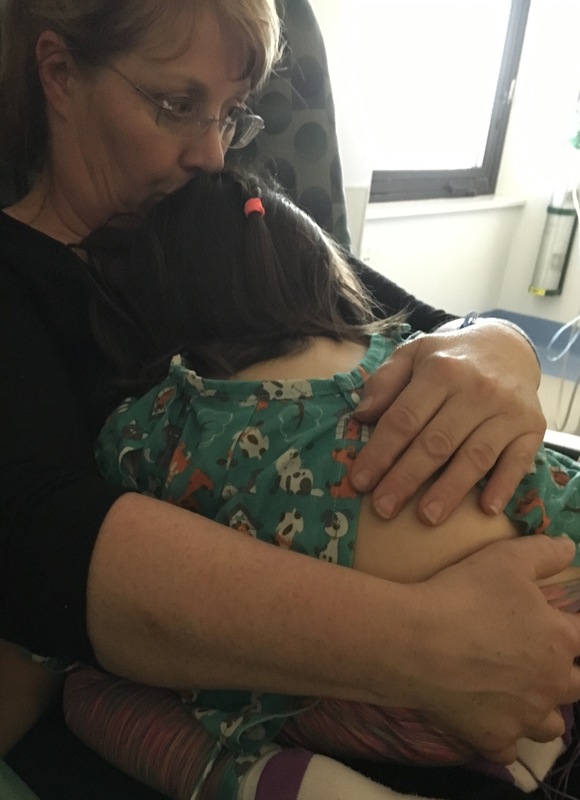 She needed to know that she would never be alone in the hospital again. We can all see God’s hand in this. The way Dan and Ben knew that Liam was to be our son. How things worked out so files could be transferred and we could add Liam without slowing down our adoption process. How our travel plans worked out so that we had to meet Liam first. Liam was so good for her. Jessica was completely shut down and refuses to talk to adults, but she loves Liam. The laughter they shared together was so beautiful. They would play and play. It brought such joy to our hearts to watch her just be a little girl. When she didn’t get sick while we were in China. When she had a couple of days at home, before her hospitalization, with Gracie and Elyse to feel safe. When they allowed us to add her on to Grace’s appointment with nephrology so she could be seen right away. When the timing allowed her to be hospitalized over Spring Break so Cassie and Reece were home for Liam to feel safe. 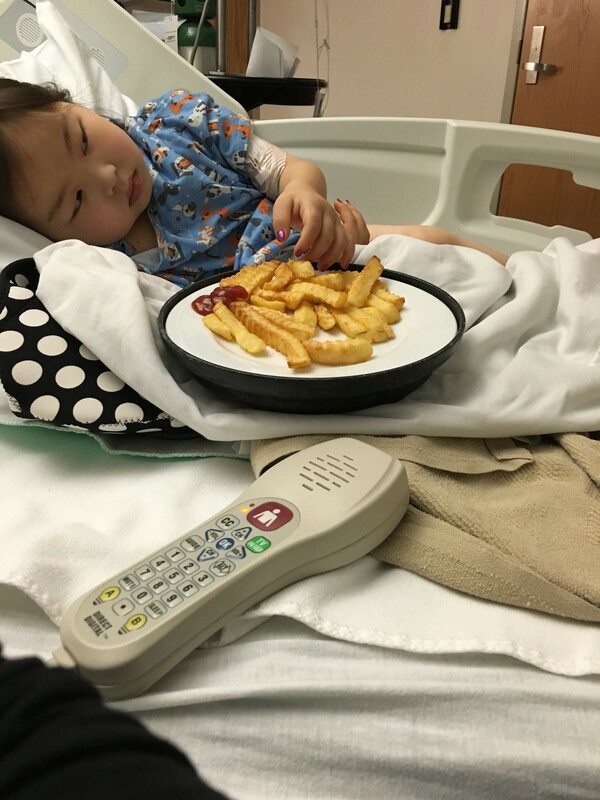 When we were admitted with nurses who had already taken care of Jasmine and understood how to care for a child of trauma and were so kind with Jessica. There are so many little things that we can see God’s hand in. If we pay attention and if we give credit where it is due, then we can see miracles in delays and hospitalizations. We can see how the bad can ultimately lead to good. Many of us have taken the verse “All things work together for good” to mean that all things are good, but that isn’t the truth. This verse means God can take the worst situation and use it for good. It does not mean that if we believe, everything in our lives will be good. We saw it with Jasmine’s wound infection and her subsequent 30 day hospital stay. We saw something horrible lead to great healing for her. 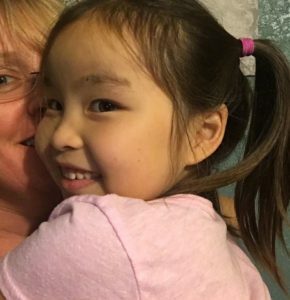 It was hard at the time to understand why a child who had been through so much had to endure so much more pain, but a year later we see the healing it brought to Jasmine. 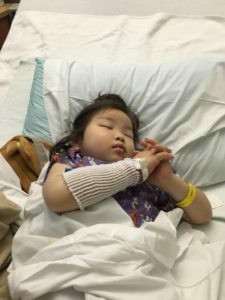 (Blog) We understand that although this hospitalization isn’t ideal, it can lead to healing and trust for Jessica too. We now know that her kidney disease can not be reversed. We know that she will at some point need a transplant and dialysis. The good news is her kidney function has improved from 15% -which means dialysis now, to 22%, which means we can wait and watch her closely for now. It could be months or even years before she needs dialysis. This is a gift. I can’t imagine starting dialysis right away. We would have done it, but it’s nice to have a buffer of time to bond and for her to feel more secure. 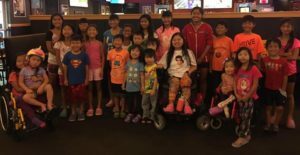 Her MRI and CAT scan showed many different spinal defects. It’s complicated and no one can really give us any concrete answers. 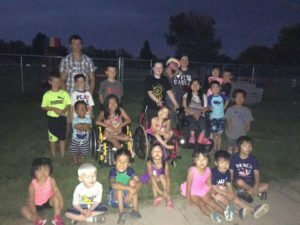 Dan believes it falls in the spectrum of caudal regression syndrome. Genetics is involved and I’m sure we will learn more as time goes on. 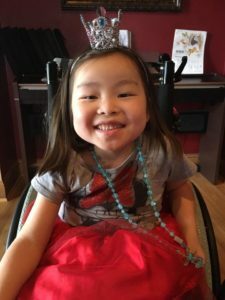 Her spinal cord ends at T8, she has severe “s” type scoliosis, there are numerous butterfly and hemi-vertebrae, she is missing ribs, and some ribs are fused, she has grade 4 vesicoureteral reflux of her right kidney. It’s complicated and we aren’t sure what, if anything, can be done to help her spine. The good news? Her heart is healthy and she is smart as a whip. She has full use of her arms and hands. She has a family that adores her and she will never go through anything alone again. The unbelievable news? That the adoption process moved quickly enough that we got to her before she had this last infection. When her charts were looked over by our urologist, he said, “She’s one bad kidney infection (urosepsis) away from passing away.” That’s pretty scary. But she got sick in the US where we could treat her aggressively and get her all of the specialized care she needed. The praise God news? Had she stayed in China and had this infection she may not have survived. 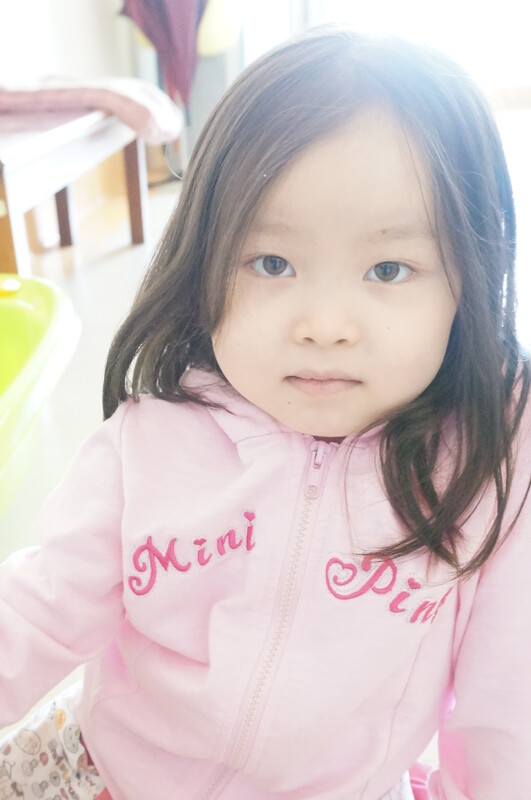 If she had survived, the infection could have accelerated her kidney failure to the point that she would have died without dialysis (she would not have been offered dialysis in the orphanage). 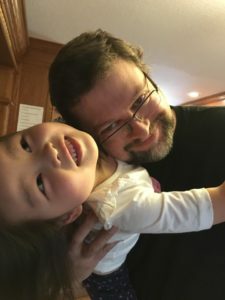 If we had not been granted an “expedite” on her adoption – we may never had made to her in time. God provided. The great news? We can help her heart heal. Her sweet personality shines through. We have seen her slowly start to trust. She reaches out for us. She shyly smiles and doesn’t shake her head no when we say “I love you”. 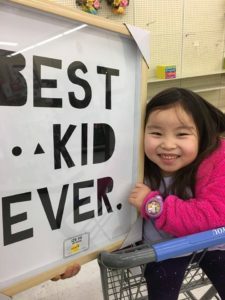 She still doesn’t really talk to any adults, but she’s figured out how to ask for what she needs with signs and pointing. She’s asked to be held. She lets us tuck her in. She allows us to hold her hand and stroke her hair. She reaches out for me when she is sleeping. She will ask me for help. This is huge from where we were in China where she hung her head and wouldn’t look anyone in the eye. Knowing what I know from Jasmine and Elyse, I know she was told she was worthless. I can see it on her face. I see it with the way she hangs her head. How she refuses to look in a mirror. How she shakes her head no over and over again if you say she is pretty. She has come along way since her admission last week. The look on her face just melts my heart. Sometimes she forgets that she doesn’t trust. Sometimes just for a few minutes you see her truly feel the joy of being loved. She soaks it in. She wants it so much. Someday she won’t instantly throw those guards back up. Someday she will know she is safe and loved. Someday she will know we can be trusted with the great gift of her love. As Dan jokes – “Resistance is futile, you will be assimilated. We are the Ellsburys”… yes a bit of Star Trek humor. We are a bit tired. Someday our sweet girl will know her worth. Someday she will know she is cherished. She will understand the peace that comes when bathed in unconditional love. Someday she will play and laugh and dance in her wheelchair and just be a little girl. I just took her downstairs to have her sedated for her MRI and CAT scan. We should be at home bonding. We should be at home where she can learn she’s safe and she can learn to trust us. Instead I had to lie her on a cart and watch the fear in her eyes as they hooked her up. She doesn’t understand why we are doing all these tests. Through my broken Mandarin I can tell her she is brave and strong and that I love her but it isn’t enough. The girls have tried to explain that she needs these things to get better, but I can see in her eyes, that it doesn’t make sense. She’s withdrawn and sad and just done with it all. She finally smiled last night. After three long, miserable days, she smiled and all was right with the world for a moment. Honestly, there’s nothing like seeing her smile. Maybe it’s because you have to work so hard to get a smile. Maybe it’s because you know how sad and hurt she truly is. Maybe it’s because her whole face just lights up. Whatever the reason, it’s like winning the lottery to be able to bring a smile to her face. Life has not been fair to our little girl. 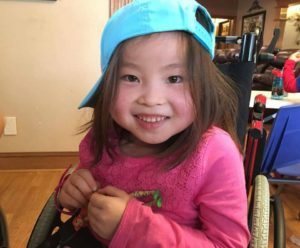 Had she been adopted before the age of 4, she probably could have avoided a transplant. Had she had the proper nutrition, her bones wouldn’t be so frail. Had she had the proper dental care, all of her teeth wouldn’t be rotted and need to be pulled. Had someone done PT, her legs wouldn’t be so contractured. 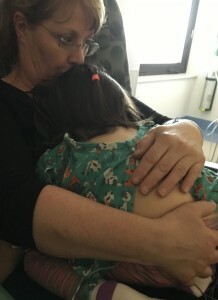 Because of this lack of care, we are now talking g-tubes and dialysis and transplants, proper nutrition and how many meds she will have to take. We have to discuss PICC lines and ports, weekly shots, blood draw, catheters, and physical therapy. I knew all these things when we were considering adopting her. I read about transplants. From Grace, Dan’s dad and my mom, I knew about kidney disease and dialysis. I’ve watched the people I love suffer from it. I am not naive. All of those things scared me and truthfully almost kept me from proceeding. I am busy. I have a ton on my plate. How could we possibly spend three hours, three times a week at the hospital? How could we spend even more time at the hospital for hospitalizations? What would be the cost with insurance and medications? 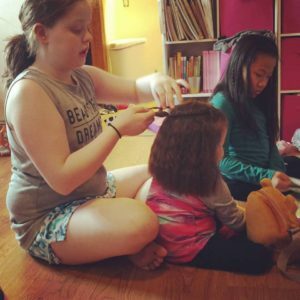 How would we continue to homeschool? Would the other kids understand one more child taking us away from home for hospitalizations? Even though those fears almost made me not proceed, seeing this face changed all of that. This is our daughter. We will fight for her. We will stand beside her. We will hold her hand. We will comfort her. We will cry tears for her. We will celebrate with her. I am sitting here beside her in the hospital. I have just been yelled at again. She doesn’t necessarily like me, let alone love me. She barely knows me. I spent an hour trying to get her to take her meds. I called Elyse and had her translate “You have to eat and take your meds or we can’t go home.” Her response was to shake her head no. She would take a med, take a sip of water, and hold the drink in her mouth for ten or more minutes. I finally let the nurses take over and went to the bathroom to cry. I don’t want people to force her to do stuff. She’s had enough of that in her lifetime. I want her to be able to trust me enough to just take them. I want to fluently speak her language so I can convince her that it’s ok. I want to go back in time and pick her up as a baby and get her the medical care she so desperately needed. It’s just so unfair. I know it would have been easier to say “No” to adopting her. I could have gone on with my life and some day in the future, after many tears were shed, she probably would have just been a little girl in a picture who stole my heart. I would have never known what she was going through. I would have prayed for her and as the days passed, slowly her memory would have faded. She may have still been advocated for or she may have fallen off the radar. Her kidneys would have failed and she would have died alone. Some one may have posted about another orphan who passed away or maybe no one would have even noticed. I could have done that. Lord knows I have cried enough tears over 100’s of children’s pictures that have touched my heart. We have advocated for children. We have fervently prayed for children when we realized that God was not saying “Yes” to our family. I have also scrolled by thousands of pictures of children who wait, barely blinking an eye. Why? Because there are many thousands of children who wait on advocacy sites and on agency lists. Because there are millions of children in orphanages. Because it is just so overwhelming. What can I do? 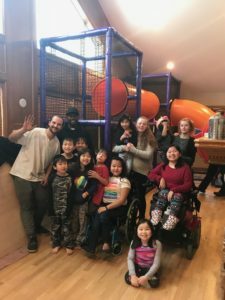 How can I make a difference? There are children all around the world that wait. If you take it all in, you could lose your mind. But JJ wasn’t just another picture. She was the daughter God lead us to. She IS my daughter even if I pretend she’s not because I am uncomfortable. God’s call isn’t false just because I am scared. 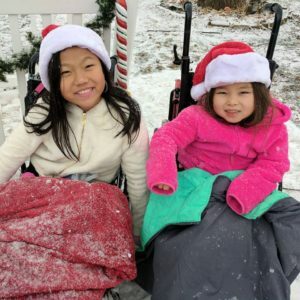 If I truly believe God has called me to her and I do nothing, it is no different than taking any of our other children from our home, taking them half way around the world, and leaving them there alone and without medical care. I can’t even fathom doing that so how could I leave her? It is so unfair to these children. They had no choice in the country that their parents lived in. They can’t do anything about lack of medical care or support. They can not control the issues that brought them to the orphanage in the first place. I think back to when Grace was diagnosed with Lupus that had affected her kidneys. Dan pushed for treatment and they did the biopsy right away. Grade 4/5 glumeruleonephritis was found. Gracie’s kidneys healed because it was found soon enough. Just a little more time and it would have been too much, the scar tissue would have been formed, and her kidneys would have been irreversibly damaged. 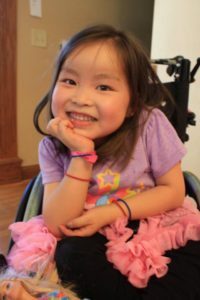 Why does Gracie get to go through her life without dialysis and a transplant? Because she was born in America to a family where her dad is a physician and knew enough to demand she be seen right now. There was nothing Gracie did to deserve it. She was just lucky enough to be born in the right time and at the right place. She is no more deserving of treatment and a happy life than JJ is. It is just unfair! Totally and completely unfair! I just want to scream and stomp my feet and throw a plate or two, but instead I will sneak off to the bathroom and have a good cry. I will dry my tears, put a smile on my face, and try my darndest to get her to a place of trusting, loving, and healing. We will figure out the right treatments. We will stand by her side and we will help her fight. Why? Because she’s worth it! I’m going to give writing a blog post on my phone a try. At the rate this is going with all my typing errors, you can look for this post sometime mid-June. This adoption trip has been interesting and one might say almost fun. It’s been the most vacation-like of any of our our trips. The first trip in 2012, was so nerve wracking, mainly because we had no clue what we were doing. Plus, Dan got food poisoning on that trip so we didn’t do a lot of sightseeing. We just hunkered down in the hotel room. The second trip, when we adopted four at once and three were much sicker than we thought, was a strap yourself in for the ride and hope you get home safe, kind of a trip. Plus, whenever we went out people were beyond unkind to Jasmine. They yelled things at her, they spit at her, and everytime we went out we had to form a circle of protection around her to keep people away. Even going to the buffet was a nightmare. We had very nice servers who would save her a spot behind a wall so that no one could see or her yell things at her while she ate. Her province was the worst for this type of behavior. 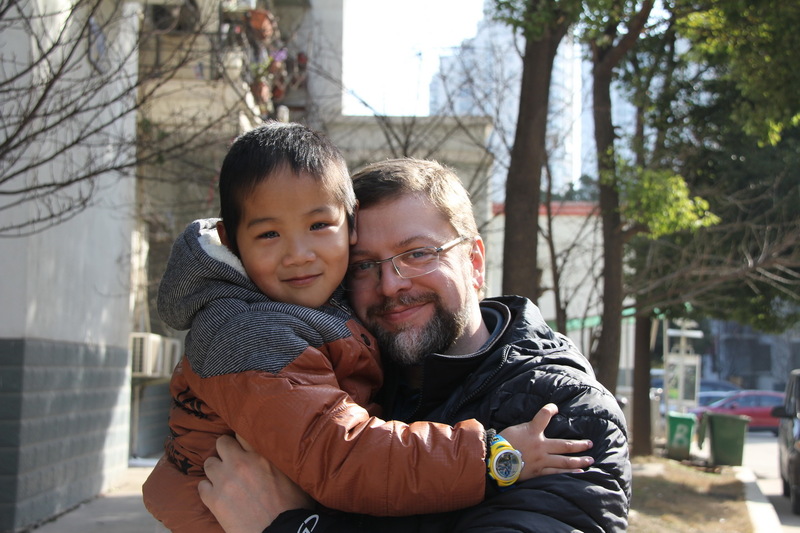 It got a little better once we got to the China Hotel in Guangzhou where there were lots of adoptive families but it still wasn’t good when we ventured outside the hotel. Elyse and Max’s trip was fairly simple except that Max had no idea how to NOT get into everything and Elyse spent most of the first part of her trip trying to figure out how to call her foster grandma. In a room with many breakables and buttons to push, Max didn’t make it very relaxing. 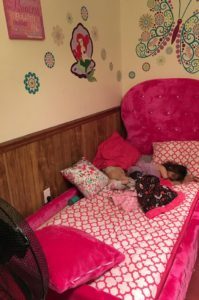 It’s hard to toddler proof a room when your toddler is 6. Plus, Dan wasn’t able to travel with me that trip. This trip, Mr. Charming readily accepted us as his parents after his foster mama told him goodbye and to go and be happy. He ran to us saying mama and baba and has had very few tears during this trip. He adores his baba and has said the word “baba” (daddy) at least a 1,000 times. He’s only cried when we went back to offices to do paperwork. We were told by his teacher that he is fearful of being taken back because his friend was disrupted and he also cried when I held a baby at one of LWB’s healing homes. Dan and I are on LWB’s board of directors and we were so happy to see the healing homes in action. I had my heart stolen by quite a few of those sweet babies and especially sweet little Christine! I was so happy to hear that she has a family in progress. I can’t say enough good things about the nannies in these homes. All in all William has done extremely well. He smiles most of the time. He says “thank you and hello and good morning” to almost everyone he meets. He says it in both English and Chinese. He is sweet and sensitive and a great little boy. The fact that he has waited almost 6 years to be adopted blows my mind. He is so smart and cute and so able to do anything he puts his mind to. 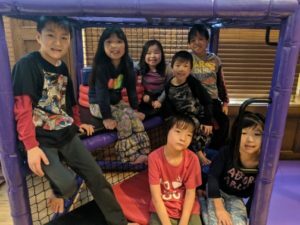 He already knows all his siblings names (no small feat), has learned many English words and corrected my Chinese, and says he wants to be a doctor. 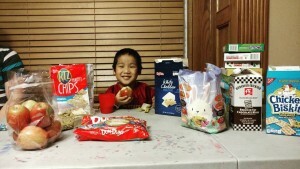 I can’t help but have my heart hurt for his bio parents who let him go, probably to get him the medical care he needed. It seems so unfair that I get to have this treasure as a son and they can not. Jessica has been a bit of a different story. Our little girl has obviously been hurt. She does not like adults and especially men. She had spent time in the hospital alone. She’s been through surgery alone. She’s been isolated away from the other kids in the orphanage. She came to me and let me hold her but it was more like she had no choice than she wanted to. It’s going to take a lot of time to heal her heart and calm her fears. That being said, by the time we went to the orphanage for a visit four days after we had met her she wouldn’t go to anyone there. She was upset when I had to hand her off to have her foley cath changed. 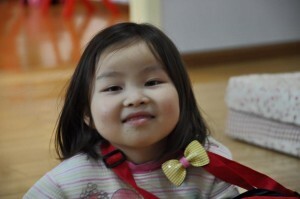 She came back to me and there was a disagreement between the orphanage staff and Dan. They had the right size foley but the wrong size connecting tubing. They wanted us to hand her to the physician who wanted to take her to the hospital to get the right tubing. He said he would be back in an hour. Dan, who is a physician, said it made no sense because it didn’t matter that the tubing was a smidge bigger and he wouldn’t allow it. They disagreed and were completely disgusted with us for refusing. Dan was not about to allow anyone to take our girl again. I do not believe we will be welcomed back there any time soon. By the time we went to meet the director before leaving the building, she was so quiet. They asked her to lunch about 10 times. They tried hard to talk her into it but she kept refusing. We left the decision up to her and by the time she got to the van she was worn out emotionally. She laid her little head on my chest and fell asleep. It was a turning point and a step in the right direction because she knew she has a voice with us and we would protect her. We’ve slowly made progress with her. She will say “xie xie mama” (thank you mama) to me when I hand her items and when I say “wo ai ni” (I love you) she shakes her head yes now. When I pick her up first thing in the morning she forgets to be afraid and lays her little head on my shoulder and hugs me. Then it’s almost like she remembers she is suppose to be afraid and lifts up her little head. But it’s those moments when I know there is hope. She’s amazing with Liam (William) though. She is the big sister even though he outweighs her by a good 15 pounds. She talks to him non-stop. They laugh and giggle and play all day long. They are already true siblings and we’ve caught them doing the “don’t copy me” game which seems to be universal. It was pretty funny. He kisses her and she pats his hands. She encourages him and tells him to finish his dinner and to throw away his papers. Liam has been good for her. God knew what He was doing. This trip would have been much harder for Little Miss had she been adopted alone. Seeing her with Liam (William) lets me know that she will be fine with the kiddos. She likes kids. She loves to mother Liam. She will be loved and will fit in just fine. I have no concerns about that. We head home Friday and I can’t wait. I miss my babies so much. I am so thankful for technology. Skype, Whatsap, and FaceTime have saved the day! I will warn anyone and everyone to be prepared to have your socks charmed off by the little guy. He’s so easy to love, everyone comments on it. They also can’t believe we’ve only had him with us for 2 weeks. My other warning is for adults with regard to Jessica. Please give JJ her space. Don’t try to pick her up, even though she’s little and cute. Don’t get upset when she won’t talk to you or look you in the eye. It’s not personal. Right now she needs time to know that adults are ok. She needs to feel safe and protected and we are going to insure that she has that. I’m happy we were called to adopt again. These two precious souls are amazing and I am feeling overwhelmed by this gift that I don’t deserve. Blessings beyond measure for being obedient to the call. The sheer thought of this brings me to my knees. 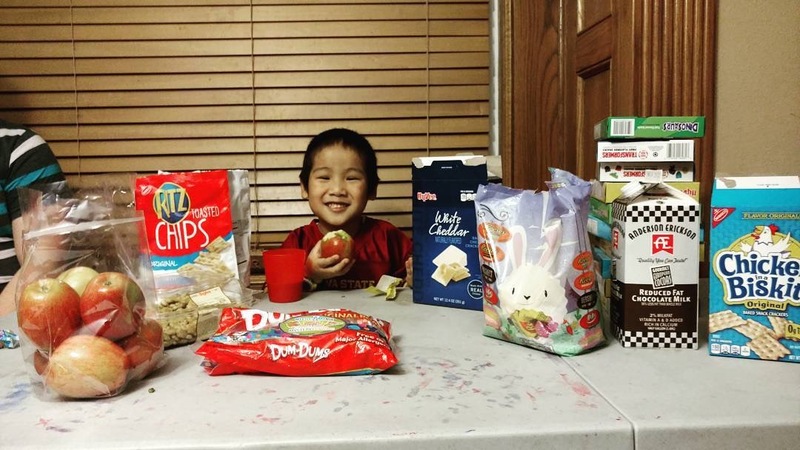 One of the fun things you get to do, as a family that is waiting, is send care packages to your child. After a certain time in the process, your agency will allow you to do this. 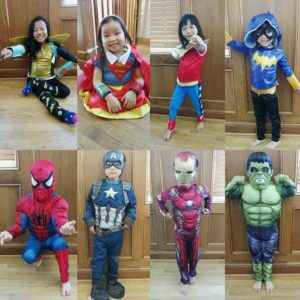 The agency will send you the address and you are allowed to send small toys, clothes, and other items. We have always enjoyed doing this, spending time shopping for just the right gifts to hopefully show we care. We love trying to guess what their personality is like and find just the right gift. The problem is that none of our children, except Jasmine and Maisey, have received their gifts. I have no idea why they never received them. They may have been lost in the mail or customs or maybe someone took them. I don’t know but it is frustrating just the same. Jasmine was the only child who came with any of the stuff we gave her. We received Maisey’s disposable camera 2 1/2 years later from Show Hope when they found it at the orphanage in a drawer. We had no indication that Maisey had received anything else from us. Its frustrating because you send pictures and letters. You want them to know your family and be prepared, at least a little, when they meet you. You take the time to pick out those special gifts and hope that they feel the love you are sending. Today Jasmine mentioned the letter than Dan had sent her. She was talking about how much it meant to know that her daddy loved her and thought she was beautiful. (Jasmine’s Letter)She said she reread that letter over and over again as she waited for us. Elyse said it must have been nice to get a letter like that. It was then that I realized Elyse never got our care package. 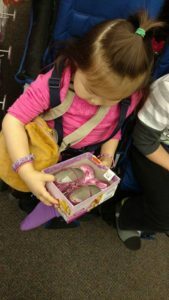 We had sent her jewelry, hair accessories, clothes, toys, and tons of pictures and letters from everyone. I never even thought about it when we met her because Elyse did come with her locket and some of our family pictures. That locket and those pictures were hand delivered by another adoptive mama who had just adopted her daughter. I am thankful that there are other adoptive parents who are willing to ask for and carry items to the children who are still waiting. Thank you Krista for doing that for us. 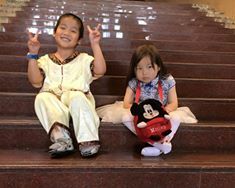 If you are adoptive parents who will travel soon, put the message out in the families of _____ orphanage Facebook groups. I’m positive other parents will appreciate it too. Luckily, Dan had typed the letter and it was still saved on his computer. Today his little girl got to read how much her daddy loved her before he even met her. He told of falling in love with her sweet face when he saw her picture for the first time. He told her how much he loved hearing her sing and how he couldn’t wait to get her home to be his daughter forever. She cried reading these words. Her foster father didn’t treat her well. She thought she deserved this kind of treatment until she met Dan. She had no idea that she should be adored and loved just for who she is. She couldn’t grasp the unconditional love of a father when we adopted her. Elyse knows what that means now and this letter is just one more thing that proves she has always had worth and she will always be loved. 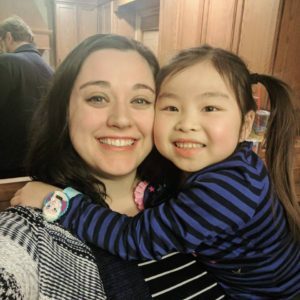 I have heard that the orphanage that Jessica is in is hit or miss with packages. Some people have said their child came with pictures and their items and others have said that their child said they never, ever received the package. It’s so frustrating because I would love for her to know we care about her. I would love for her to know what we look like and be prepared for her new family. I wish I knew the rhyme or reason behind why some get them and some don’t. I know there are orphanages who wait until right before the child is adopted because they have been burned before by a family backing out. I can’t imagine what that would do to a child’s heart. How horrible to wait for that forever family you heard you had, who never, ever showed up for you. So I can understand the orphanage wanting to be careful. I can understand somethings getting lost in the mail, but 6 out of 8 packages never making it are pretty bad odds. I think I may just take the chance that our children will get their packages. I will pray that if they don’t get them, then the person who does get them feels all the love that went into the package and will have their lives changed by it. Wish us luck. Maybe say a prayer or two that our newest family members actually do get their gifts so they know that they are loved and have a forever family that will be there soon.